Scientists think they've caught sight of the elusive Higgs boson, a theoretical subatomic particle that makes up the glue that holds the universe together. The announcement was made at a press conference on Tuesday. After billions of dollars and a decade of sweat from thousands of scientists deep in the ground under the Alps, the great mysteries of physics may finally be answered. Perhaps. The Higgs may exist after all. The Large Hadron Collider, a massive atom smasher hidden underground in the Alps along the border of France and Switzerland, has a price tag of $10 billion and the job of shooting atoms through its 16.8-mile circular tunnel at insanely high speeds. The CERN scientists running this vast project have been on the hunt for the Higgs boson, which the media have warmly dubbed the "God Particle." The scientists cannot see the Higgs boson itself; it breaks down too quickly to be directly observed, and only its "shadow" can be seen. They do believe, however, that they have narrowed its mass down to the region of 124 to 126 GeV. (Remember, mass = energy according to Einstein’s famous E=mc^2.) That's approximately 125 times heavier than a proton and 500,000 times heavier than an electron. The data is not conclusive, but if the Higgs actually exists, then the CERN scientists are on the way to getting a snapshot. The Higgs boson theoretically isn't charged, but it does have a significant mass. This is a big deal to physicists. All known matter is made up of protons, neutrons, and electrons, which are made up of quarks, leptons, and gluons and the like. These are the building blocks of all matter. Physicists want to know what gives these subatomic particles their mass in the first place. Why don't particles just race around at the speed of light? What gives them inertia, and what slows them down? What makes it possible for our atoms to stick together so that we can exist? Is there a particle that unifies all the forces we see in the physics of the universe? The Standard Model in particle physics attempts to explain how all the fundamental particles of the Universe interact with each other. The model, which is often compared to the Periodic Table of Elements used by chemists, consists of 16 particles that make up all matter in the Universe. The problem is that the Standard Model is not complete. 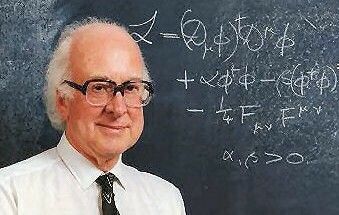 In 1964, a physicist by the name of Peter Higgs, currently professor emeritus at the University of Edinburgh, proposed that empty space is not really empty at all; it is filled with a background energy field, like a lattice through which all other particles have to move. Wherever a particle shoots through this field, the field gets distorted and clusters around the particle. The Higgs boson is that clustering of the field around a particle - like a crowd of people around a starlet. The particle is given mass, making it harder for it to change direction, speed up or slow down, like the crowd-clustered starlet trying to move across the room. People surround her as she moves, making it harder for her to speed up or slow down. In a similar way, it is believed that subatomic particles get their mass - their inertia, their resistance to changes in motion - through interactions with the Higgs Field. That was Peter Higgs' idea. Since a field cannot be seen, scientists are looking for the clusters, the uncharged particle that would interact with every other subatomic particle to give them all mass. Since then, scientists have been scrambling to find this particle, the Higgs boson. Back in 2008, world renowned physicist Steven Hawking told British TV, "I think it will be much more exciting if we don't find the Higgs. That will show something is wrong, and we need to think again. I have a bet of $100 that we won't find the Higgs." If the recent excitement is all based on random blips that have no statistical significance after all, then the physicists will have to embrace the renewed mystery of the Universe and be open to other possibilities. "If we don’t see [it], that would be an incredible discovery, because then the Standard Model doesn't work," Pierluigi Catastini, a research associate with the ATLAS experiment, told Mashable Tech. "If we do find the Higgs boson, then we fill in the most important piece." A significant number of scientists, though, are hopeful about proving the Higgs Field and are willing for Hawking to eventually lose his bet. The project involves more than 8,000 scientists from at least 85 countries. The existence of dark matter was proposed in 1932 by astronomer Jan Oort, who measured the motions of nearby stars in our Milky Way relative to the galactic plane. He found that the mass of the plane must be more than the mass of the material that can be seen. A year later, Fritz Zwicky examined the dynamics of clusters of galaxies and found their movements similarly perplexing. Over the years, many spiral galaxies were observed and found to be swirling too fast to be held together by the gravitational pull of the visible stars. Since the speedy-moving stars have not been flung out through space, some scientists describe dark matter as "the glue that holds the universe together." Astronomers cannot detect or measure dark matter directly because it emits no light or radiation - hence the name. Its existence is inferred from the gravitational effect it has on visible matter (such as stars and galaxies). There have been a number of conjectures regarding the nature of dark matter, but all of them have eluded any empirical validation. Physicists hope CERN's Large Hadron Collider will shed even more light on dark matter, dark energy, the existence of extra dimensions, and the fundamental nature of matter, energy, space and time. Science, like religion, often requires us to take a leap of faith. Any honest scientist should admit that despite centuries of scientific discovery and technological advances, most of our universe remains a mystery. There are large numbers of areas that, despite careful investigation, we do not fully understand, from the "magic" of photosynthesis to the mysterious particles that make up the fabric of space-time. Science continues to develop and change as scientists discover new evidence, and it is one of the great joys of being human to explore and discover the marvelous brilliance and detail God used in putting this world together. But even as scientists analyze the data from the LHC and hope to catch a glimpse of the Higgs boson, we're certain that the name "God particle" is more accurate than some physicists would choose to admit. Whether or not dark matter is busy keeping distant stars from shooting further into space, we know that Jesus Christ holds each of us, and we trust him to hold the atoms in our bodies together with as much care as he takes in sustaining the entire universe. Even if Science changes, we know He does not. "Through faith we understand that the worlds were framed by the word of God, so that things which are seen were not made of things which do appear" (Hebrews 11:3). "For by him [Jesus] were all things created, that are in heaven, and that are in earth, visible and invisible, whether they be thrones, or dominions, or principalities, or powers: all things were created by him, and for him: And he is before all things, and by him all things consist" (Col 1:16-17).